In the course of the last 60 years, the Israeli collective memory has been burned with several never to be forgotten images . As part of Israel@60 events, filmmaker Dov Gil-Har returns to seven of these images, meets the protagonists of the historical moments, and reconstructs the images. The earliest was taken in 1949; the most recent in 1997. Snapshots is composed of 7 segments of between 7 to 12 minutes each. The stories were aired on Channel 10 news on consecutive evenings, and gained significant public attention.. The Ink Flag, 1949 – A small platoon of Palmach soldiers reached Eilat at the end of War of Independence, and raised the Israeli flag, with the naïve feeling that this was also the end of wars. The white cotton sheet painted with blue ink was to become the most renowned Israeli flag ever. 59 years later, the octogenarian gentlemen and one lady, return to Eilat to raise the ink flag again. 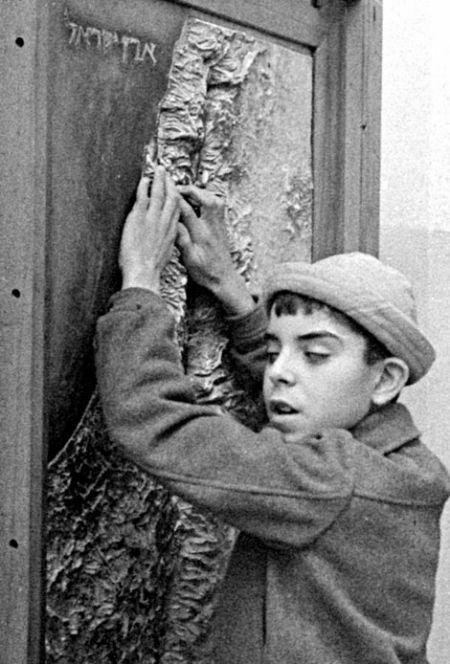 The Blind Boy, 1957 – Internationally acclaimed photographer David Rubinger, meets the blind boy, a new immigrant from Morocco, who Rubinger photographs touching a relief map of Israeli map. The Paratroopers, 1967 – The paratroopers are back at the Western Wall to reconstruct the moment they first saw it. Will they be able to raise the Israeli flag as they did during the Six Day War? Esther Roth, 1976 – The leading Israeli athlete ever, reconstructs her 100 meters run in the Montreal Olympics. Will Esther Roth be able to jump the hurdles again, 32 years later? Macabbee Tel-Aviv, 1977 – The most magical year of all is re-enacted here. The fabulous basketball team beats the Russian giant, CSKA Moscow and brings home the European Cup for the first time ever. Rabin's Assassination, 1995 – Everybody wept that night, but one powerful image was burned into the collective memory. 13 years after the trauma, Alina Trachtenblit is back at the square, with a torch, and the same old tears. Apropos Café, 1997 – A policewoman holds a bleeding baby girl whose mother has just been killed in a terrorist attack. 11 years later the policewoman and the young girl meet to reconstruct the moment.